Old Fashioned Siamese cat breed information and advice. The Old Fashioned Siamese is a much softer shape than the modern Siamese type. As Old Style Siamese breeders tend not to show their cats, many focus on health, genetic diversity, and a moderate build. Progressive retinal atrophy (PRA) can affect both modern and Old Style Siamese, but responsible breeders test their cats for the disease to make sure they are PRA negative. Old Stye Siamese enjoy being groomed, but they don’t need to be groomed every day as they don’t have an undercoat and are a short-haired breed. A good brush once a week should be all that’s needed. Make sure you clean their ears and around their eyes too. Although the Old Style Siamese and the modern Siamese look different, they have the same temperaments. They have lots of energy and are very intelligent, with many enjoying a game of fetch, and are completely devoted to their owners. Many love to sleep next to, or on, their owner’s head while in bed, and will follow them wherever they go. Their intelligence also means they can be trained to walk on a lead. They do have a mischievous streak, and are often likened to naughty children, with very high energy levels. Many are known to have kleptomaniac tendencies, so don’t be surprised if some of your possessions seem to go missing, and turn up in strange places! They will enjoy climbing up curtains, and can even open doors. Don’t forget that Siamese often have very loud and demanding voices, and will make their feelings known. Siamese will not suit a home where they are going to be on their own all day, as they are an intelligent and active breed that needs plenty of attention and company, preferably the human sort, as they can be very needy and could become destructive if they get lonely. The ideal owner of a Siamese would be someone who works from home, is retired, or a family where someone will be at home for at least part of the day. If you really want a Siamese, and you are out all day, it is important to have two, ideally a pair of siblings, with lots of space for them to run around and get into mischief together. The Siamese originated from Thailand (formerly know as Siam), with the oldest records of Siamese found in Thai texts from the Ayutthaya period between 1351 and 1767. In the late 1800s, a group of British people travelling to Siam saw these ‘very exotic’ cats for the first time, and decided to bring them back to the UK, where the UK Cat Fancy — now the Governing Council of the Cat Fancy (GCCF) — named them Siamese. All the Siamese that exist today can be traced back to these 11 seal-point Siamese. Over the next few decades, it was discovered that seal-point Siamese carried dilutes of seal and could produce kittens with chocolate, blue, and lilac points. 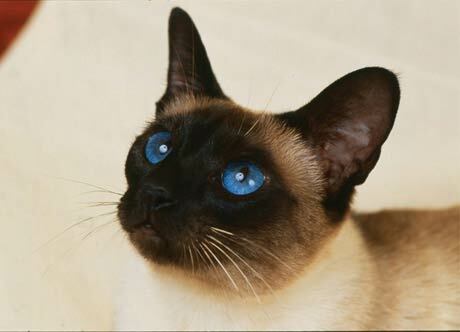 Then, in the 1940s and 50s, Siamese breeders outcrossed seal-point Siamese with a British domestic cat to introduce new colours and point colour genes. By the 1950s, Old Style Siamese were extremely popular with the general public, but breeders were gradually changing the look, as it was felt, by some, that Old Style Siamese were a little too ‘everyday’ in their appearance. The modern style of Siamese, with their larger, more wide-set ears and slender bodies, grew in popularity, and Old Style Siamese breeders realised their cats no longer fitted in with the judges’ interpretations of the Siamese standard, so many retired from breeding. A few continued, however, and a small set of dedicated Old Style Siamese breeders in the UK have been working towards improving the Old Style Siamese gene pool.